Keeping our carpets clean and looking nice can be a nearly impossible feat. No matter how many products you buy or how many times you vacuum. Carpets go through a lot each day, from the dirt that we track with our shoes to the accidents that pets have on them. It is very important to have carpets professionally cleaned on a regular basis to prolong their life and keep our home clean and healthy four our families. Carpet is an excellent choice for the home or office because of it’s soft nature it is comfortable to the knees, feet and hips. Contrary to the critics it is ok for people with allergies have carpet for its filtering properties. If you vacuum with a true HEPA filter vacuum at least weekly and have us clean your carpets every 3-6 months you should feel the difference. We have allergy treatments, just ask for them. Professional carpet cleaning services can ensure that your carpets are clean, free of bugs, mold, and allergens. They use safe and effective methods that will protect the look for your carpet and help them maintain their shape and form. 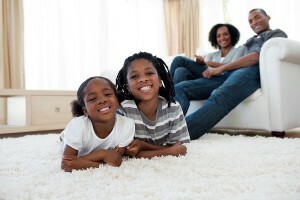 Using carpet cleaning services will save you money on the long run because your carpets will last longer. We use state-of-the-art equipment. Please watch this video for a demonstration of our outstanding carpet cleaning service.